328 ✉ Federal Republic of Germany / postal stationery - nice and extensive inventory from approximate 1500 postal stationery, mostly unused packed in a carton, with also numerous picture post postal stationery, partly factory packaging, special editions and so on, whereby also issues from Berlin are present. Huge purchase price respectively catalogue value! 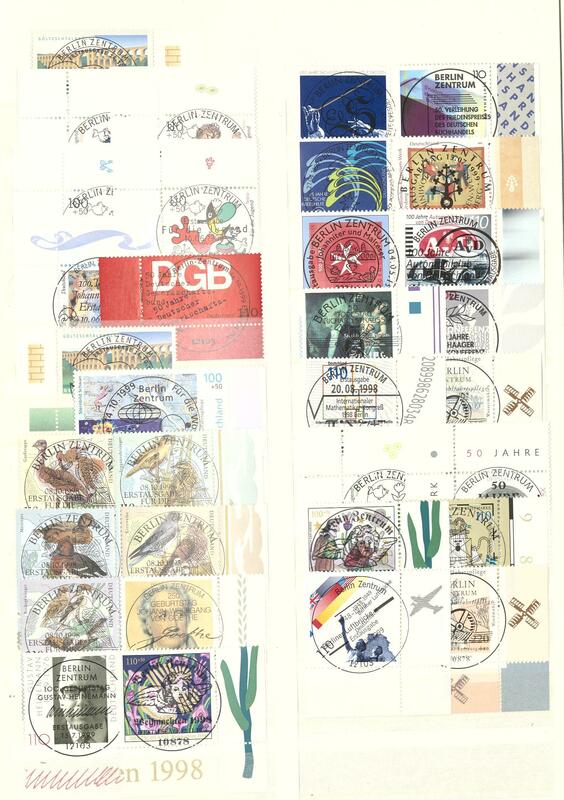 329 ✉ Federal Republic of Germany / BERLIN - enormously inventory from approximate 1200 covers and cards packed in a carton. 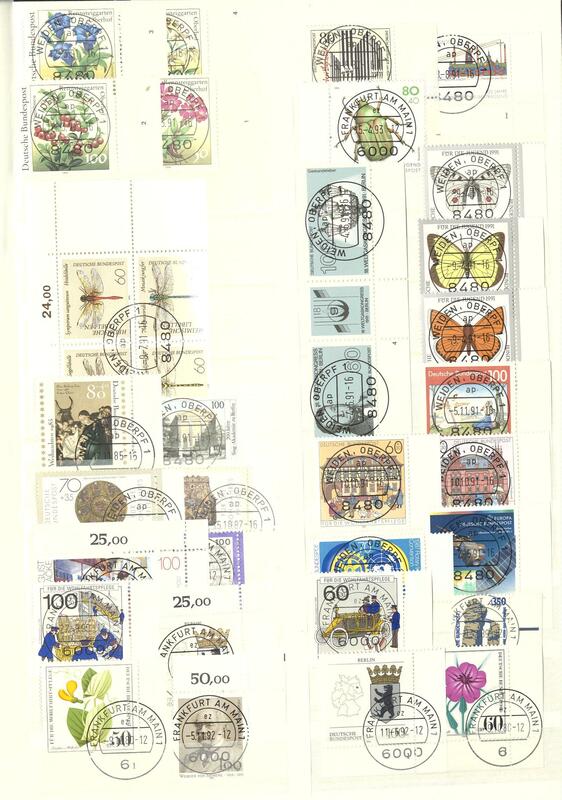 Many nice documents, decorative frankings, registered, insured letter, package cards and so on. Extensive treasure trove! 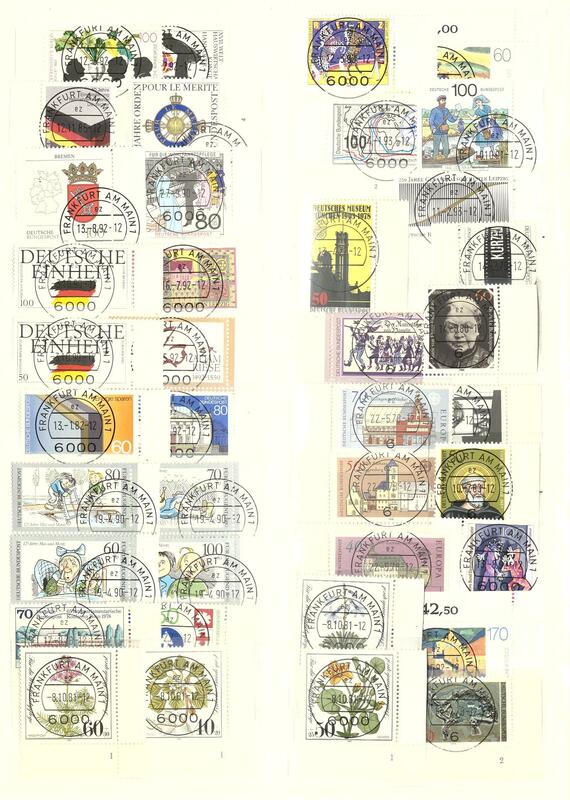 330 ✉ Federal Republic of Germany - nice lot of approximate 600 covers packed in a carton. 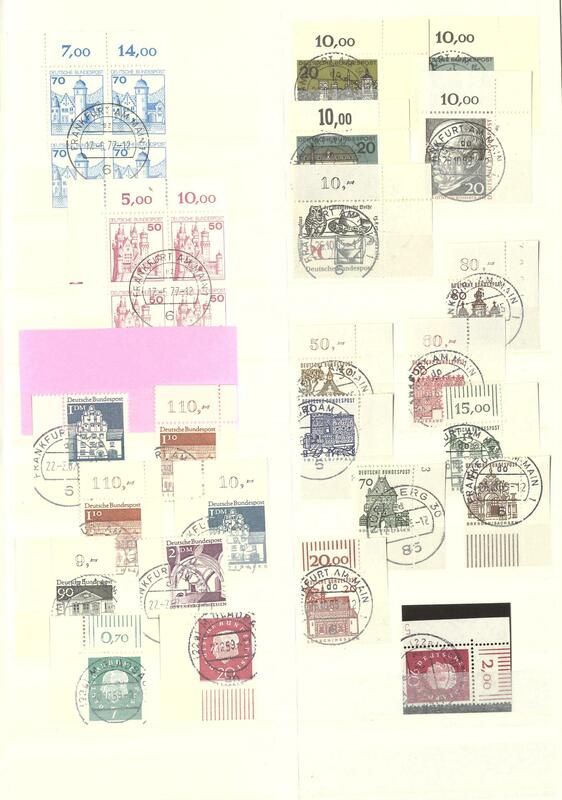 Many nice documents, numerous registered, decorative frankings, welfare and youth sets abundant and so on. Treasure trove! 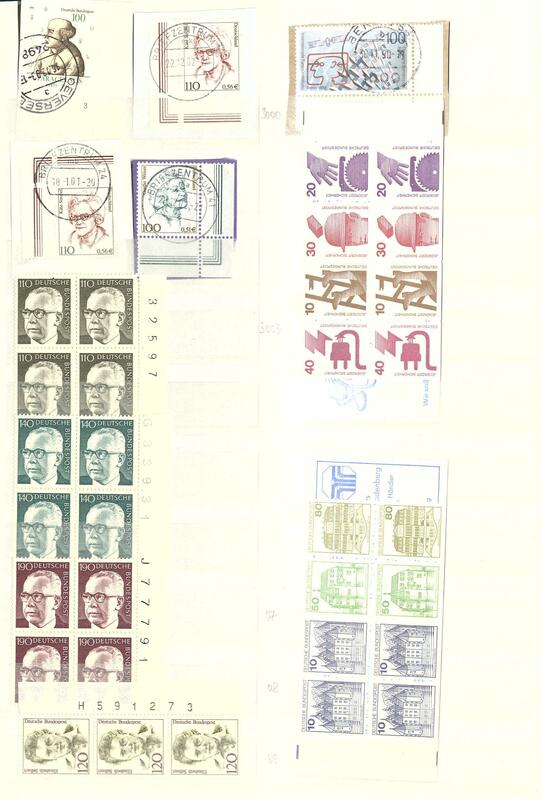 332 x Federal Republic of Germany / coil stamp for vending machine - extensive inventory packed in a carton with lots of material, as well various issues and denomination value, mint never hinged values, nice documents, First Day Cover and so on. Enormously acquisition price! 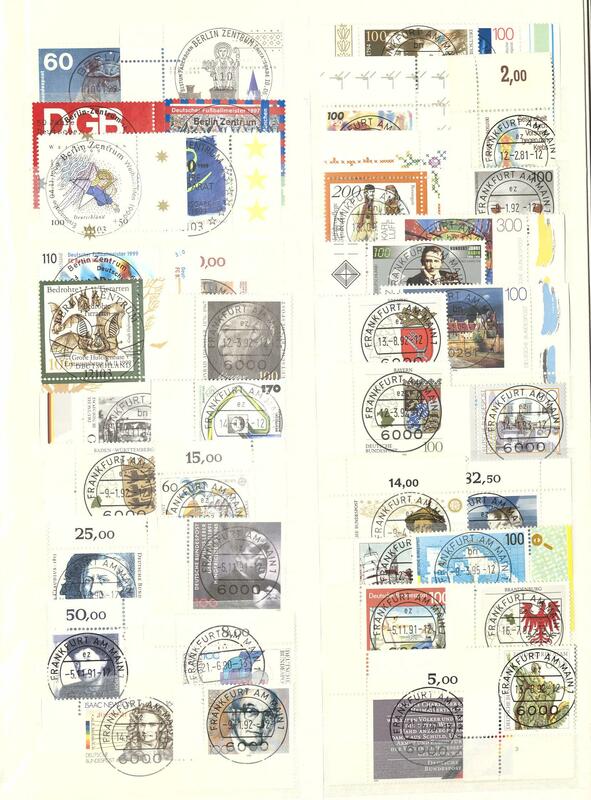 340 Federal Republic of Germany / sights - huge mint never hinged inventory of the issue sights in two large thick stock books accommodated with an enormous amount of material, with also corners of the sheet, upper margins, blocks of four, multiples, many high denomination value pending 700 Pfg. And so on. Perfect for liquidation. Michel approximate 17800,- €. 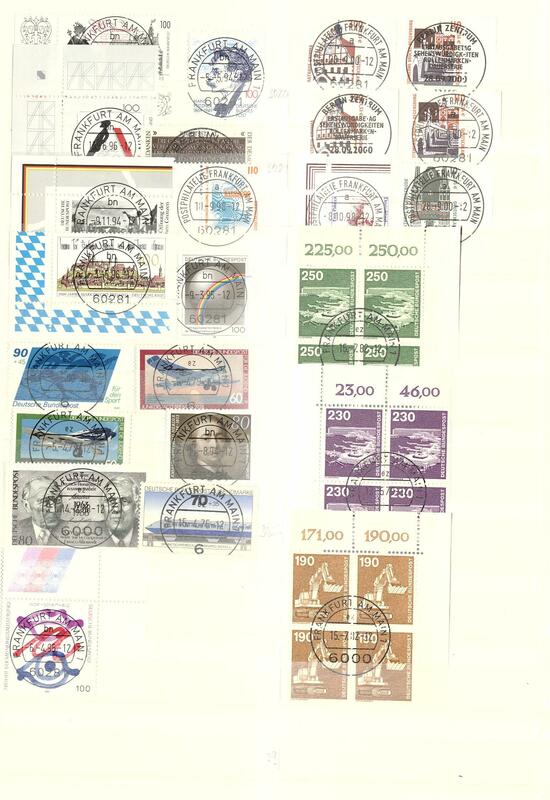 341 Federal Republic of Germany - extensive mint never hinged inventory postal stamps in three large stock books organized including multiples, margin copies, se-tenant, end of a coil stamps roll, corners of the sheet and so on. Included are the issues important German, small buildings, as well Brandenburg Gate. Huge catalogue value! 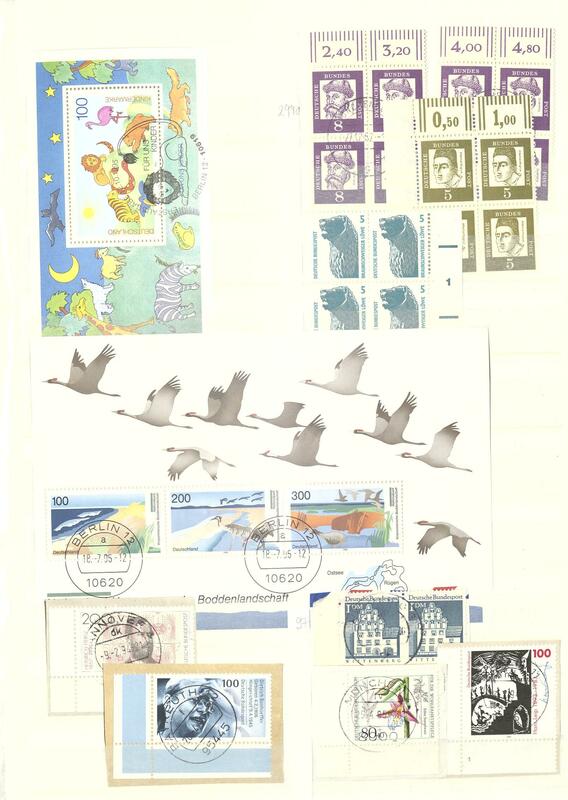 358 ✉ Federal Republic of Germany / minister cards - extensive lot of minister cards packed in a carton with beautiful copies, different subjects and so on. Large number of pieces and high trade value! 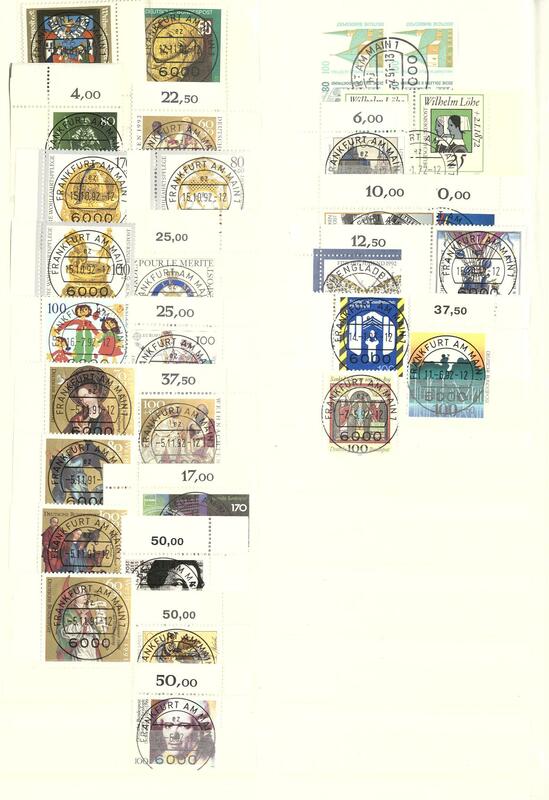 359 x Federal Republic of Germany - 1991 / 2005, complete collection the annual collections. These carry the issues with first day special cancellations. 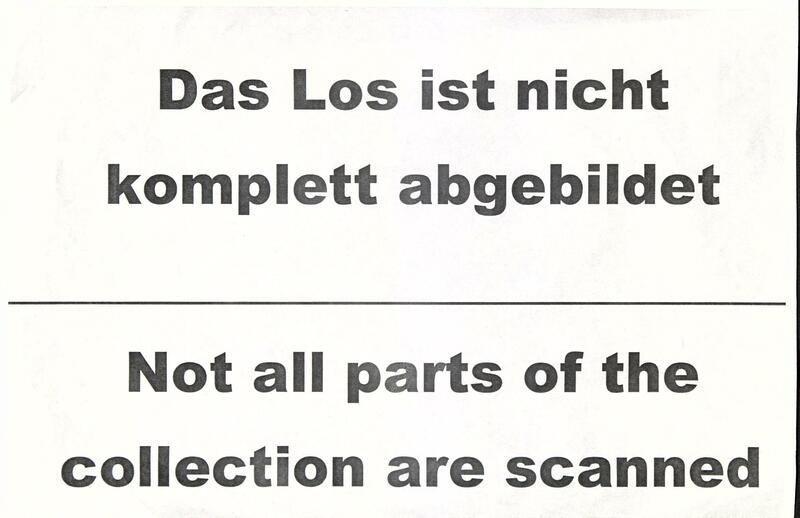 Included are also the forerunner from 1991 / 92. The post price / subscription price amounted to be on approximate 1200,- €. 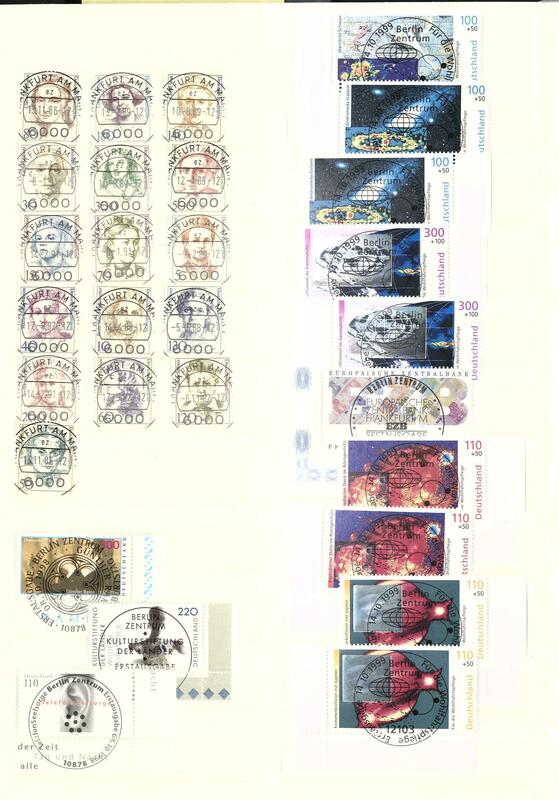 360 ✉ Federal Republic of Germany - enormously inventory from approximate 800-1000 large-sized covers with many beautiful frankings, with also souvenir sheets from resistance fighters, blocks of four, margin copies and corners of the sheet, welfare issues numerous and so on. All genuine used documents from the sixties years to a bank used. Interesting lot! 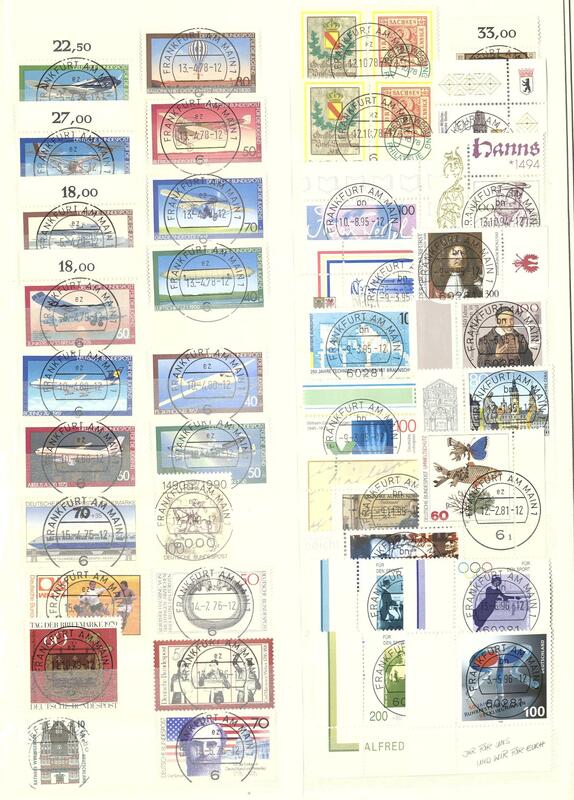 361 Federal Republic of Germany / sheet of ten - 1994 / 2000, very nice mint never hinged collection the miniature sheets of 10, except for the double nominal complete in three beautiful lighthouse hingeless printed form albums. A maintained object! Michel approximate 5000,- €and original price the albums approximate 400,- €. 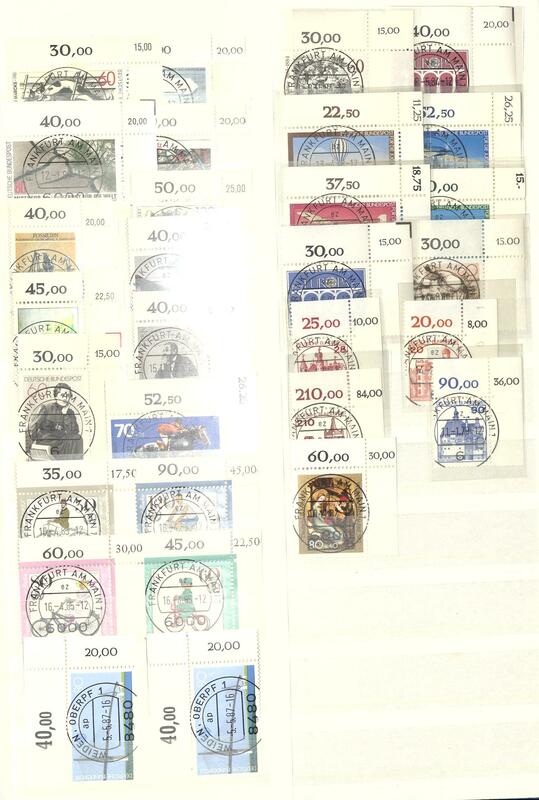 374 Federal Republic of Germany / se-tenants - nice mint never hinged collection of the se-tenants on lighthouse hingeless preprinted pages. 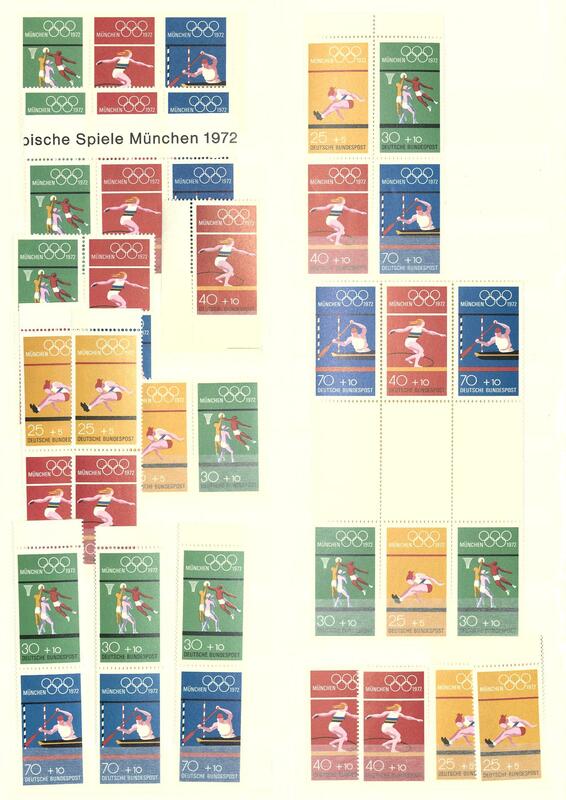 Thereby also good part Heuss including all 15 combinations Heuss watermark sideways, all se-tenants olympic games 1972 including the gutters and so on. A magnificent object! 387 /⊙ Federal Republic of Germany - nice and extensive lot in a large thick stockbook accommodated with mint never hinged issues, however lies the main value on the very nice centric cancellation issues from the fifties with sought-after values, also numerous corners of the sheet, corrected sheet value counter and so on. A magnificently inventory! 412 /⊙ Federal Republic of Germany - 1949 / 72, rich collection in the safe hingeless printed form ring binder, with also Stephan 1949 mint never hinged, welfare 1949, 10 Pfg. St. MaryÂ´s Church, transport exhibition 1953, 30 Pfg. Welfare 1953, welfare 1954 / 55 mint never hinged and lots of further material, complete years and so on. Favorable! 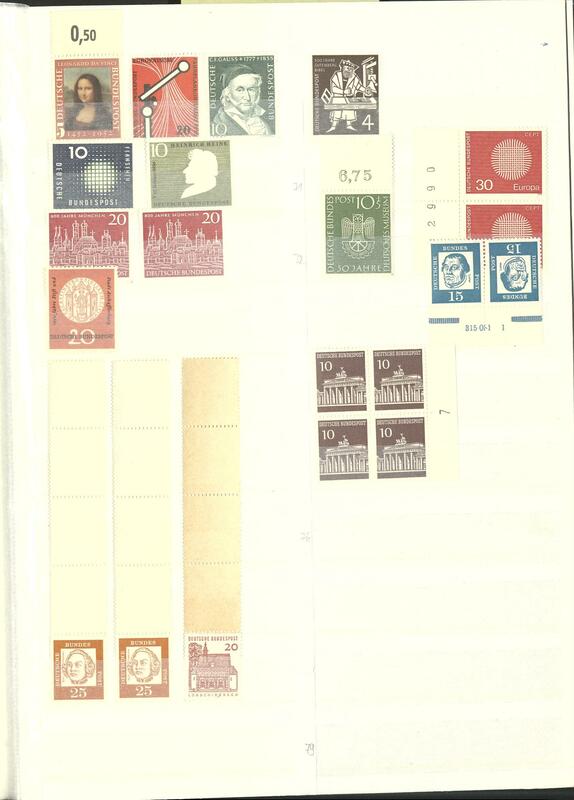 416 /⊙/ Federal Republic of Germany - 1949 / 66, rich collection in the Lindner hingeless printed form ring binder, partly twice collected with useful issues, as well Bach seals mint never hinged and used, St. MaryÂ´s Church mint never hinged, Wuppertal set mint never hinged, welfare 1951 mint never hinged, transport exhibition 1953 mint never hinged and used, as well much further material. Very favorable! 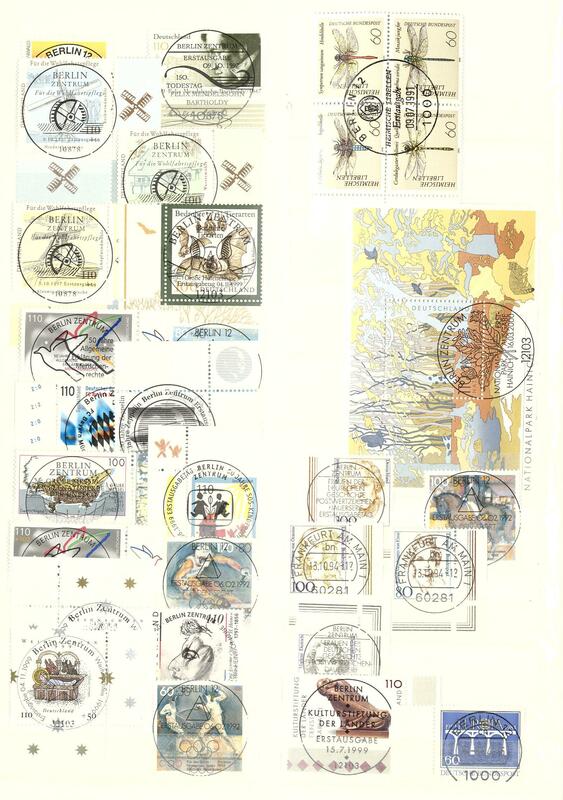 417 GA Federal Republic of Germany / postal stationery - huge inventory from approximate 4500 postal stationery, predominantly unused housed in moving box, with also a great many picture post postal stationery, double cards, special postal stationery and so on. Huge acquisition price, very favorable! 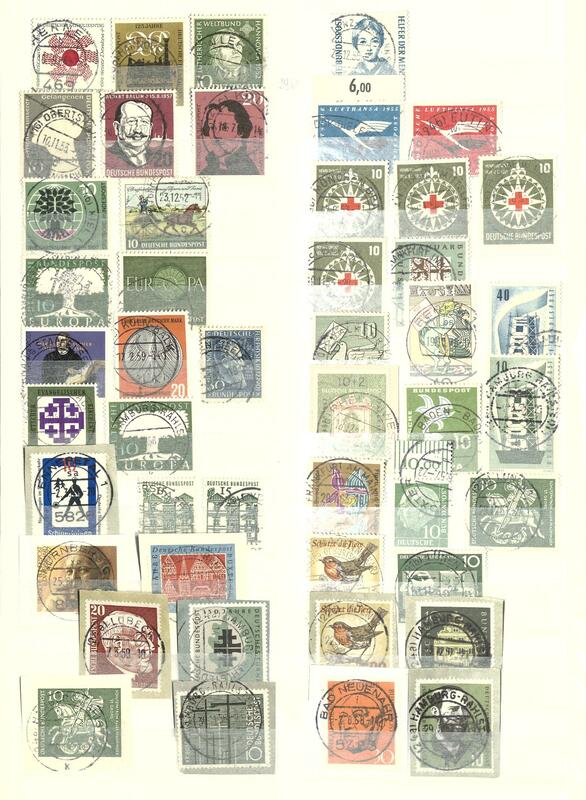 426 Federal Republic of Germany - huge inventory from almost only mint never hinged issues packed in a carton with an enormous amount of material, with also numerous blocks of four, multiples, corners of the sheet, welfare and youth sets and so on, whereby also issues from Berlin are present. Perfect for liquidation, Michel approximate 12000,- €. 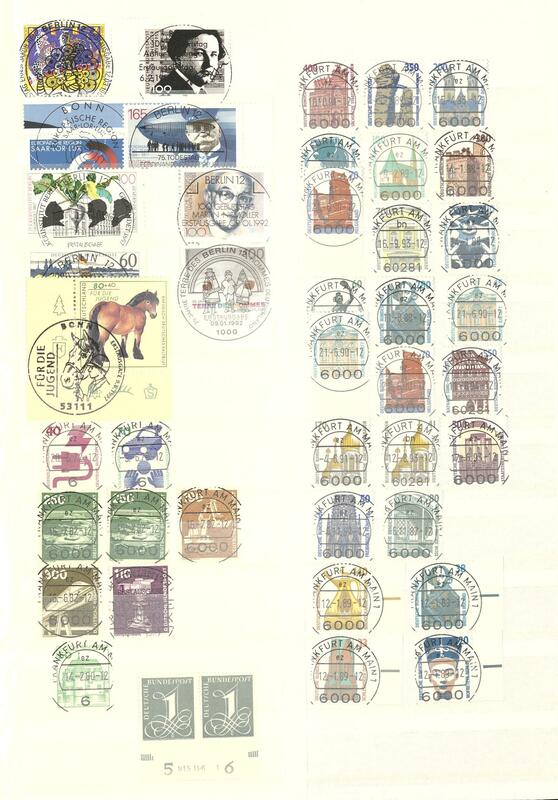 427 x Federal Republic of Germany - extensive lot packed in a carton with numerous issues on stock cards, as well a large number souvenir sheets from Beethoven, mostly multiple, first issues including Lower House of German Parliament 1949, 100 years stamps, 10 Pfg. St. MaryÂ´s Church on piece, better se-tenants Heuss watermark sideways and so on. Very favorable! 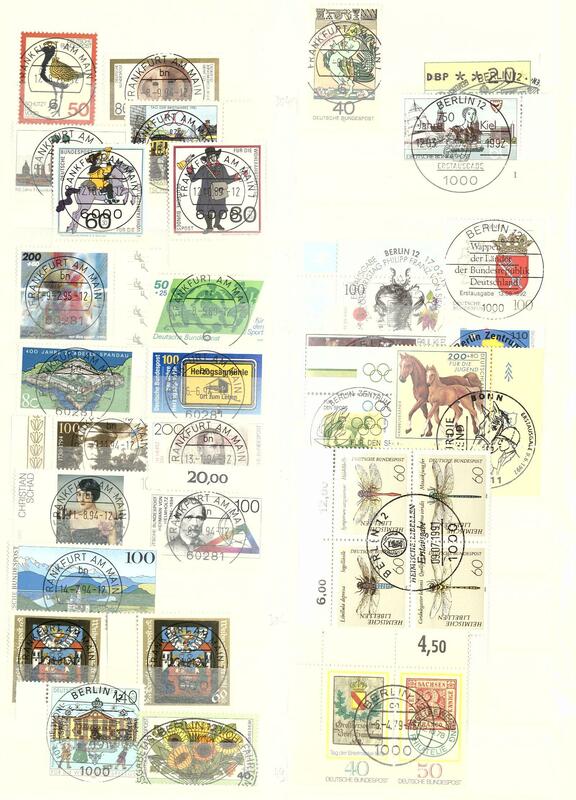 429 ⊙ Federal Republic of Germany - 1997 / 2000, very nice collection from 175 different miniature sheet with first days special cancellations, unfolded and in perfect condition in two lighthouse hingeless printed form albums. Already the pure post price amounts wide over 2000,- DM and original price the albums approximate 250,- €. 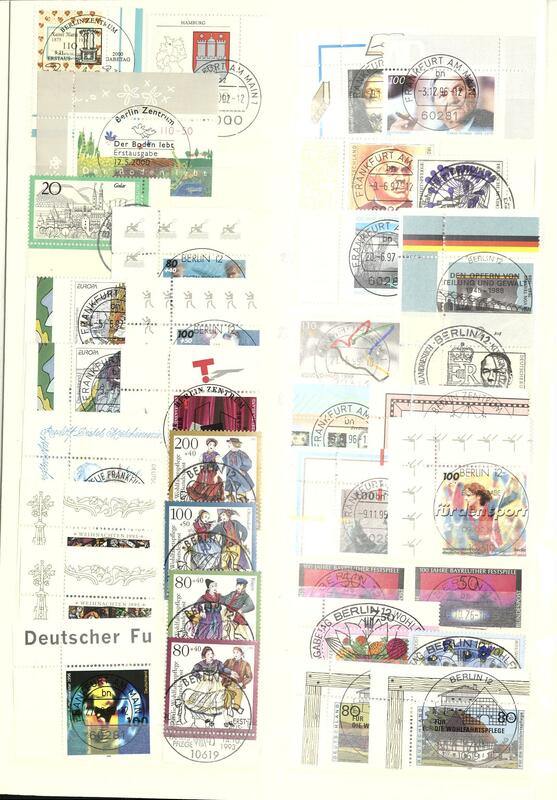 442 ✉ Federal Republic of Germany - nice lot of over 1000 documents, all mainly illustrated First Day Cover, as well also nice special postal stationeries from the sixties years to to the year 2009 packed in a carton, very assorted. Favorable! 451 x Federal Republic of Germany / important German - very extensive inventory of the issue important German with mint never hinged and used values packed in a carton, all on stock cards, stock pages, as well in glassine-bags, enormous number of pieces!